Alexis, left, and Ashley Hayashi display their trophies at the 2013 Compete Nationals Martial Arts Competition, held last month in Ontario. 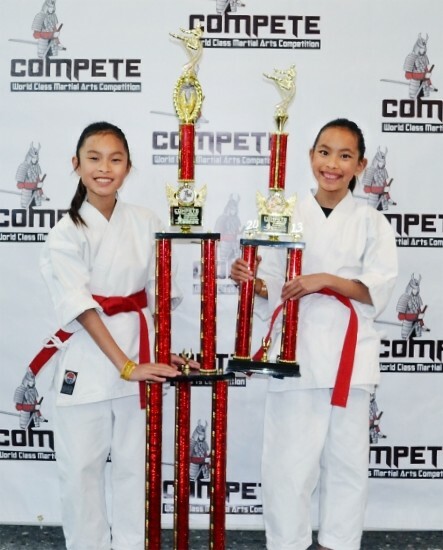 ONTARIO — Twin sisters Alexis and Ashley Hayashi showed off their martial arts skills at the 2013 Compete Nationals Martial Arts Competition, held Feb. 22-24 at the Ontario Convention Center. More than 2,200 competitors in 900-plus divisions took part with over 4,000 spectators watching. Athletes came to display their dedication to their respective arts, including many different styles of karate, tae kwon do and kung fu. Now in its 26th year, the event is one of the biggest martial arts competitions of the year in the Los Angeles area. It is IMAC World-rated and the first North American Sports Karate Association Triple Crown Event of 2013. Alexis and Ashley, both 11-year-old red belts, competed in the Karate Traditional Forms Advanced Division. Alexis, being last year’s champion, was back to defend her title. She again took first place performing kusanku-dai. Ashley came second in performing a variation of the form called chatan yara kusanku. Both kata are advanced Japanese karate black belt forms. This is the girls’ fourth year of competing, with their previous titles including last year’s Compete Nationals winners as first (Alexis) and second (Ashley) place finishers in traditional forms. At the 2012 World Championships in Las Vegas, Alexis took first in both weaponry and traditional forms. Both sisters are 2011 World title holders, among several other honors. Having trained in several martial art schools in San Diego over the past eight years, the girls have relocated to Monterey Park, and are now trained by their father, Ken, who holds four black belts, in hapkido, tae kwon do, ho shin moo do and wado ryu karate. The twins work out at Almansor Park in Alhambra, with their younger siblings Natalie and Brandon. While they no longer compete in sparring, they are both trained in practical self-defense and full-contact fighting. Alexis and Ashley have been studying karate since they were three years old. Born three months premature and weighing only 1.5 pound each, the pair remained in the hospital for some months after birth. After being told that there was a strong possibility that each girl would face developmental issues and would require constant physical and mental therapy in order to keep up with others in their age group, their parents decided that karate classes would be of great benefit. By the age of three, though still extremely underweight and overall very low in strength, their physical training in karate helped them to show dramatic improvements in coordination, strength and mental stimulation. Martial arts have given Alexis and Ashley a healthy outlet for their abundant energy. Other than their national and world titles, the Hayashi girls are productive fifth-grade students. Alexis enjoys drawing anime and occasionally talking with an English accent, while Ashley enjoys singing and ballet.